A US-based minority rights advocacy group has alleged that political neutrality of some Indian diplomats has been compromised. New Delhi: Several Indian diplomats have broken an unofficial ban on attending political events abroad and have increasingly participated in those organised by affiliates of the Rashtriya Swayamsevak Sangh (RSS) since the BJP came to power in 2014, a US-based Indian minority rights advocacy group has alleged. 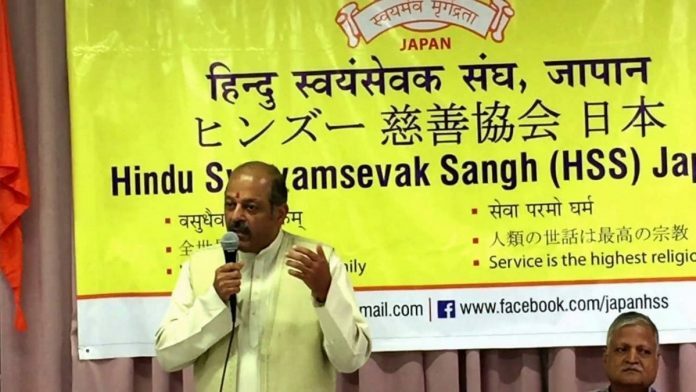 India’s ambassador to Japan, Sujan Chinoy, as well as several consul-generals across the world, including in the US, Canada, Germany, Australia and New Zealand, have participated in events organised by the Hindu Swayamsevak Sangh, the international wing of the RSS, the Organisation for Minorities of India (OFMI) has said. They have also participated in events organised by RSS affiliate Vishwa Hindu Parishad, and occasionally even by the international wing of the Bharatiya Janata Party (BJP), it has said. OFMI has said such behaviour is unusual for diplomats and raises serious concerns about their political neutrality. While former senior diplomats ThePrint spoke to were divided about the ethics of diplomats attending such events, highly placed sources in the ministry of external affairs sought to explain these as community or diaspora events diplomats have always been attending. A report by OFMI said that it had found that since 2013, more than 15 Indian consular officials in nine countries have participated in 24 Sangh Parivar events in their official capacity. The trend, however, seems to have picked up pace in the last two years when 19 of these appearances were recorded. The minority rights group report, released earlier this month, is based on media coverage of the events. “In all cases, the diplomats are advertised by their titles and ‘not’ as private individuals,” OFMI spokesperson Arvin Valmuci told ThePrint. Of these appearances, there’s even a YouTube video of Indian ambassador to Japan Sujan Chinoy delivering a keynote address at an HSS event on 8 October, 2017, to mark the birth centenary of RSS ideologue Deendayal Upadhyaya. Most recently, the Indian consul general in Toronto, Dinesh Bhatia, delivered the keynote address at a 19 October event organised by HSS. Pictures of the event were re-tweeted by Bhatia’s personal Twitter handle, as well as by the Indian consulate’s official Twitter account. The diplomat’s presence at the event, and the news that he shared the stage with Ved Nanda, Sanghchalak of HSS North America, and Saumitra Gokhale, International Coordinator of HSS, sparked outrage among Indian minority groups in Toronto. Swati Kulkarni, India’s consul general in Atlanta, was the chief guest at an HSS event commemorating Hedgewar’s founding of the RSS on 27 October. The list goes on and includes names of consul generals in Houston, San Francisco, Sydney, Munich and Auckland. Several of the diplomats named in the OFMI report, who spoke to ThePrint on the condition of anonymity, said “they were not participating in political events, but in Indian community functions”. One US-based diplomat named in the report said there were over 200 Indian community organisations there, from those belonging to Bohra Muslims to Gujarati and Telugu as well as the HSS. “Sometimes they just ambush you. You are invited to one kind of Indian community event and it turns out to be another,” the diplomat said. ThePrint also spoke to several former senior diplomats and asked them if it was wrong for diplomats to attend such events. There was no unanimity in their responses. A highly placed source in the ministry of external affairs said Indian ambassadors and consul-generals do attend community functions organised by different community associations and diaspora groups. “The call to participate/level of participation is taken by the individual ambassadors/CGs depending on the nature of the event, occasion and local participation,” the source said. Former foreign secretary and national security adviser under the UPA government, Shivshankar Menon, said that such affiliations indicate that the “civil services are being politicised, which is not a good thing”. “They are supposed to represent India, not any individual party or sect or group,” he said. Deb Mukharji, a former Indian envoy to Nepal and Bangladesh, said it was “absolutely shocking” to learn that Indian diplomats had attended RSS events. “It goes against the very grain of the civil service conduct rules,” he said. “Clearly it’s a reflection of the very murky environment in which we live today — this is an indication on the kind of pressures being brought on the civil service,” Mukharji added. Kanwal Sibal, another former foreign secretary, however, said diplomats are within their rights and duties as politically neutral representatives to attend events organised by any organisation or party that isn’t banned. “They participate in Congress and BJP events or any political party in which the local community is involved. The Sangh Parivar is not banned, in fact the prime minister and president belong to that grouping,” Sibal told ThePrint, adding that in his mind this was a “completely unnecessary controversy being created”. Aftab Seth, India’s former ambassador to Japan, seemed to echo that view. While diplomats “are normally not supposed to use the embassy premises for religious purposes, going to functions organised by community groups like Kerala Samaj etc is part of your job,” he told ThePrint. This report has been updated to correct a spelling error. Sujan Chinoy and FS Vijay Gokhale are batchmates. One cannot picture Shri Gokhale attired thus, complete with a red bindi on his forehead. I guess some bit of cleverness is required to survive. In the present BJP dominated scenario, who would take the risk of rubbing the RSS the wrong way! In simpler terms, which officer would want to be shunted out of Japan and sent to Nepal etc, or given a desk job in Delhi.